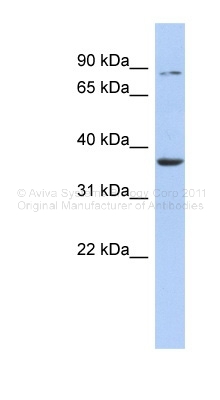 Western Blot analysis of HS3ST1 expression in transfected 293T cell line (H00009957-T01) by HS3ST1 MaxPab polyclonal antibody.Lane 1: HS3ST1 transfected lysate(33.77 KDa).Lane 2: Non-transfected lysate. TA329076 (1µg/ml) staining of Human Cerebellum lysate (35µg protein in RIPA buffer). Primary incubation was 1 hour. Detected by chemiluminescence.